20 A None No Power Seat 20 A is a standard Business class seat however, the proximity to the galley may be bothersome. 20 D None No Power Seat 20 D is a standard Business class seat however, the proximity to the galley may be bothersome. 20 G None No Power Seat 20 G is a standard Business class seat however, the proximity to the lavatory and galley may be bothersome. 20 K None No Power Seat 20 K is a standard Business class seat however, the proximity to the lavatory and galley may be bothersome. 31 A None No Power Seat 31 A is a standard Economy class seat that has restricted legroom. The proximity to the galley may be bothersome. 31 C None No Power Seat 31 C is a standard Economy class seat that has restricted legroom. The proximity to the galley may be bothersome. 31 D None No Power Seat 31 D is a standard Economy class seat that has restricted legroom. The proximity to the galley may be bothersome. 31 E None No Power Seat 31 E is a standard Economy class seat that has restricted legroom. The proximity to the galley may be bothersome. 31 F None No Power Seat 31 F is a standard Economy class seat that has restricted legroom. The proximity to the galley may be bothersome. 31 G None No Power Seat 31 G is a standard Economy class seat that has restricted legroom. The proximity to the lavatory and galley may be bothersome. 31 H None No Power Seat 31 H is a standard Economy class seat that has restricted legroom. The proximity to the lavatory and galley may be bothersome. 31 K None No Power Seat 31 K is a standard Economy class seat that has restricted legroom. The proximity to the lavatory and galley may be bothersome. 48 D None No Power Seat 48 D is a standard Economy class seat that has extra legroom. The proximity to the lavatories may be bothersome. 48 E None No Power Seat 48 E is a standard Economy class seat that has extra legroom. The proximity to the lavatories may be bothersome. 48 F None No Power Seat 48 F is a standard Economy class seat that has extra legroom. The proximity to the lavatories may be bothersome. 48 G None No Power Seat 48 G is a standard Economy class seat that has extra legroom. The proximity to the lavatories may be bothersome. 49 A None No Power Seat 49 A is a standard Economy class seat that has extra legroom. The proximity to the lavatories may be bothersome. 49 C None No Power Seat 49 C is a standard Economy class seat that has extra legroom. The proximity to the lavatories may be bothersome. 49 H None No Power Seat 49 H is a standard Economy class seat that has extra legroom. The proximity to the lavatories may be bothersome. 49 K None No Power Seat 49 K is a standard Economy class seat that has extra legroom. The proximity to the lavatories may be bothersome. 61 D None No Power Seat 61 D is a standard Economy class seat however, this seat may have restricted legroom due to the transition from 4 to 3 seats, making this seat misaligned with the one in front. 61 E None No Power Seat 61 E is a standard Economy class seat however, this seat may have restricted legroom due to the transition from 4 to 3 seats, making this seat misaligned with the one in front. 61 G None No Power Seat 61 G is a standard Economy class seat however, this seat may have restricted legroom due to the transition from 4 to 3 seats, making this seat misaligned with the one in front. 63 A None No Power Seat 63 A is a standard Economy class seat that may have limited recline. The proximity to the lavatory may be bothersome. 63 C None No Power Seat 63 C is a standard Economy class seat that may have limited recline. The proximity to the lavatory may be bothersome. 63 H None No Power Seat 63 H is a standard Economy class seat that may have limited recline. The proximity to the lavatory may be bothersome. 63 K None No Power Seat 63 K is a standard Economy class seat that may have limited recline. The proximity to the lavatory may be bothersome. 64 D None No Power Seat 64 D is a standard Economy class seat that may have limited recline. The proximity to the lavatory may be bothersome. 64 E None No Power Seat 64 E is a standard Economy class seat that may have limited recline. The proximity to the lavatory may be bothersome. 64 G None No Power Seat 64 G is a standard Economy class seat that may have limited recline. The proximity to the lavatory may be bothersome. Hainan Airlines' Airbus A330-300 is flown in a two class configuration with 32 flat bed Busniess Class seats and 260 standard Economy Class seats. Business class features such amenities as plush silk pillows, slippers, and an onboard espresso machine. Hainan operates another version of the A333 that flies with just First and Business Class. Fully agree with the other review on the same seat: I'm a tall guy as well and the legroom was better than I've had in a long time. IFE is good and has very recent movies and FA's are very friendly and service constantly. Never seen an airline where the FA's clean the toilets frequently but Hainan does it. Would defintely fly again! Avoid this seat at all cost. No leg room at all as row 61 transistions from 4 seats to 3 seats. Close to the toilets so the constant flushing is deafening. Would i fly Hainan Air again. No way. The entire flight was horrendous. Packed in like sardines. Crew eith very little english. Avoid!! The aisle is indeed also very narrow. Flight attendants sometimes may bump into you if you have a seat located directly at the aisle. Seats are a bit narrow but o.k. to rest for the flight. Service has overall improved: compared to a few years ago, the flight attendants now do understand better English and can react better. Food was o.k., an express menu was offered for the night flight - not as fast served as for other airlines but did provide more time to rest. Flown TLV-PEK 10 hours flight. It was one of the best flight that i've ever flown. Great Service throughout the flight. Flight attendants were patient and gave amazing service. IFE was really good, great variety of movies and music. The seat was extremely comfortable and i am a tall guy (1.87). I enjoyed the long journey with Hanian! 54H good seat.Hainan economy seats are roomy and comfortable compared to other carriers. Outstanding service by the flight attendants. Good selection of seat back movies. An abundance of food throughout the flight.Large area for standing in the very back. Flew hainan from Seattle to Beijing and back, best international flights I have been on.For some reason all China based airlines do not allow portable electronics in flight (phones, iPads, laptops) Thankfully Hainan has a wide selection of videos and music. Also its true what another reviewer wrote about the seatbelt sign being always on, however the flight attendants do not have any issue if you get up and go to the restroom or go to the back area to stand for a bit. I am 5'8" and was very comfortable on 11 hour flight. Business class seats A, E, F and K are hidden away and private whereas the rest are directly onto the aisle and are not private. The aisle is narrow and it feels like you're walking in someone's bed. If you're travelling as a couple, E and F are close together but there is an annoying dividing screen which pops up of its own accord from time to time. It's about shoulder height before it pops up. For some reason it seems they leave the seatbelt signs on all the time (happened on China Southern as well so may be a Chinese thing) so you have to ignore them if you need to go. I am 6'2" tall and had great difficulty getting comfortable in this seat. I dount that it is 31-32" pitch. I felt like a cork in a bottle. 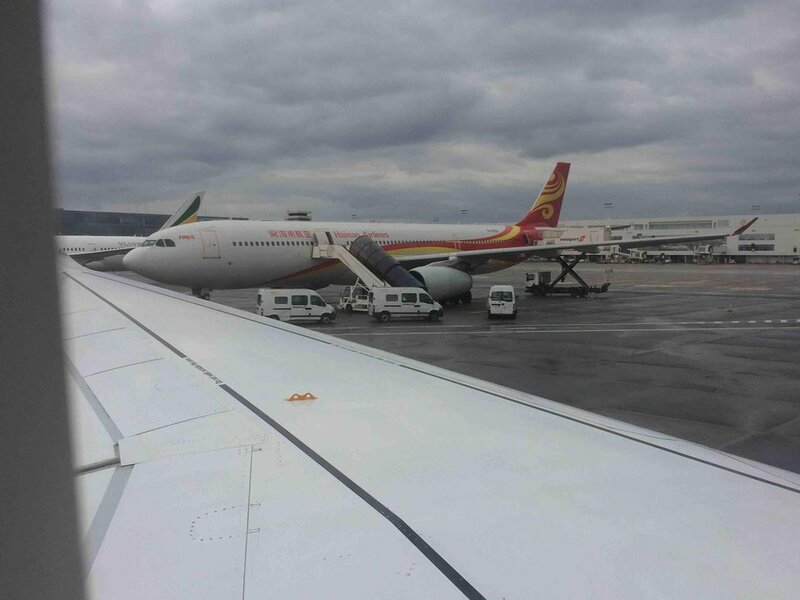 Hainan Airlines flies 1 versions of Airbus A330-300.